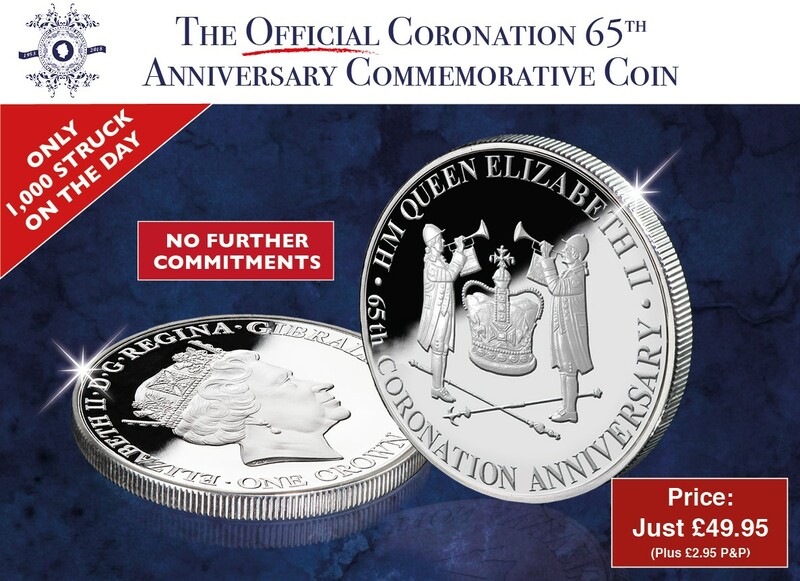 An official Coronation 65th Anniversary legal tender commemorative coin has been issued in celebration of the 65th Anniversary of Her Majesty Queen Elizabeth II’s Coronation. To commemorate this once in a lifetime prestigious milestone, you can now own this limited edition coin for just £29.95 (plus £2.95 P&P). On the 2nd June 1953, the official Coronation ceremony took place at Westminster Abbey. On that memorable day the Queen made an oath to govern the people, uphold law and justice and to maintain and preserve the Church of England. Struck as a limited edition legal tender issue, this commemorative coin features an impressive image of the traditional trumpeters that play a significant role in the Coronation ceremony. Struck to Uncirculated quality, this coin is exclusively available from The London Mint Office. Want to know more? Read Justin's On The Money Product Review of Her Majesty Queen Elizabeth II’s 65th Coronation Crown. We're sorry but the product is sold out.